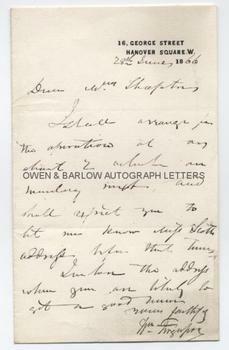 SIR WILLIAM FERGUSSON Autograph Letter signed. ALS. 1p and integral blank leaf. 16 George Street, Hanover Square, W. 28th June 1866. To Mr [Thomas] Shapter. "I shall arrange for the operation at say about 2 o'clock on Monday next and shall expect you to let me know Miss Scott's address before that time. Enclose the address when you are likely to get a good sum [?]" 8vo. Approx 7 x 4.5 inches. Fine. Sir William Fergusson was a pupil of the anatomist Dr Robert Knox and became his demonstrator. He became the foremost surgeon of his day and was renowned for his operative skill. He was president of the Royal College of Surgeons, surgeon to Prince Albert Sergeant-Surgeon to Queen Victoria, senior surgeon at King's College Hospital and a Fellow of the Royal Society. He invented many surgical instruments, including the bulldog forceps and a mouth gag for cleft palate operations - a procedure he revived and revolutionised. The letter is from a 19th century collection made by a daughter of Thomas Shapter (1808-1902), a doctor known for his early work in epidemiology and his book on the cholera outbreak in Exeter.